There can be many variables that determine the tone of an instrument, none the least being the natural variations found in the inherent acoustic qualities of the individual pieces of timber that make the top and back plates. However, by designing and mixing different combinations of the two bracing patterns (X or parallel) with the softer spruce engelmann or euro and red maple, or the harder red spruce and sugar maple, to a large extent the tone of the instrument can be adjusted and controlled. 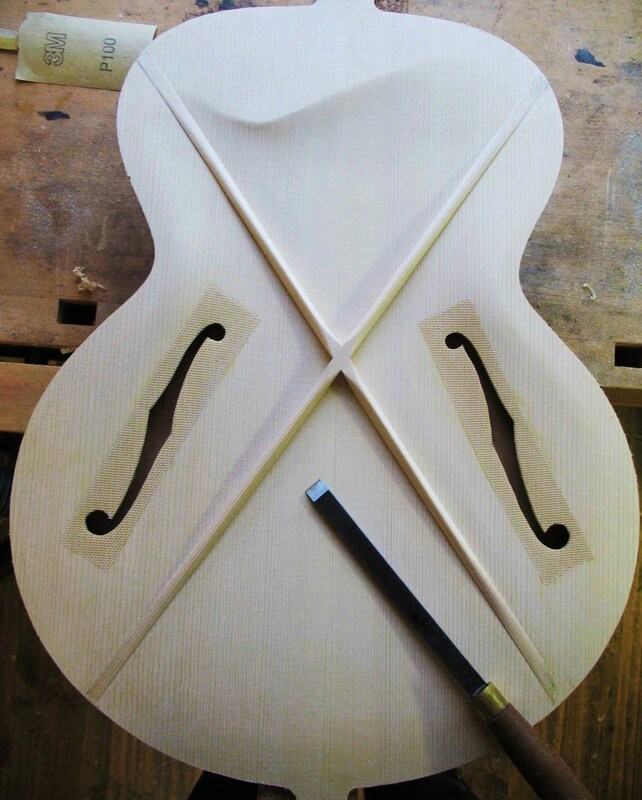 Whether on a mandolin or a guitar, the type of wood used and the effect of the bracing patterns work the same in changing the flexibility of the soundboard. Braces running parallel with the grain have the greatest effect of stiffening and increasing the mid-range response, producing a brighter clearer tone. The more the braces are angled from the grain the more flexible the top becomes, producing a warmer bass response. I like to think of it as a spectrum where, at one end of the scale, the softer wood and X brace emphasises more bass frequencies. At the other end is the harder species and parallel tone-bars that help boost midrange and projection, with subtle variations in between. A simple horizontal brace that reinforces the open grain area behind the soundhole. Because of their fundamental design, oval hole models have a natural abundance of bass frequencies in the tone. To help boost the midrange response, the hard species combination of red spruce and sugar maple is only used for these models. The option of "thickening" the tone with the softer species, as available for f hole models, is not offered for the oval hole models as increasing the midrange response with the harder wood is a real benefit to overall projection and power in an oval hole instrument.